A true testament to the importance of collaboration and networking, the Grand Valley State University Panhellenic Association cosponsored an educational event with WGVU Radio. WGVU Radio is a public radio station owned and operated by Grand Valley State. They are also an affiliate of PBS, and partially because of that relationship they sponsored an event “A Path Appears,” on January 20th. 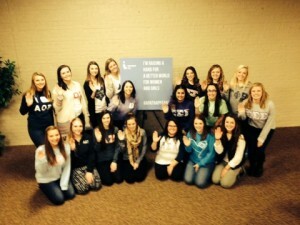 Education and awareness is a huge piece of the Circle of Sisterhood mission. Without education and awareness, people would not be moved to give. 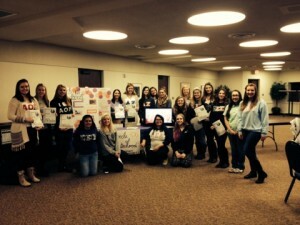 The Grand Valley State Panhellenic Association was able to promote the Circle of Sisterhood to over 150 attendees at the “A Path Appears” event. At the event, the Panhellenic Association had a table with educational materials set up so that attendees could sign up for information, and learn more about the Foundation. They also had the “Support the Circle of Sisterhood” video playing. One of the best things they did was have volunteering Panhellenic women hand out flyers and discuss the Foundation with attendees. Best piece of advice; perfect that elevator pitch! It is the greatest tool for promotion. Now, they did do a little fundraising at the event as well. They sold buttons for a dollar each, and they raised $32.00. That $32.00 can go a long way! And we now have 32 more ambassadors for the Foundation, proudly wearing their Circle of Sisterhood buttons. 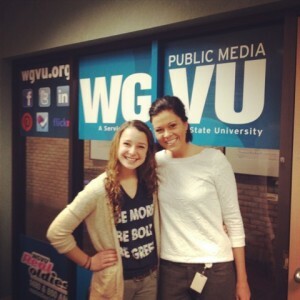 WGVU Radio and the Panhellenic Association worked so closely together during this event that Amy Terhaar, Major Gifts and Grants Coordinator for WGVU Public Media, asked the Panhellenic Vice President of Philanthropy, Katie Gripe, to participate in an interview on WGVU Radio. Amy shared the efforts of WGVU to educate about the realities of human trafficking, grants they had received, and promoted their next “A Path Appears” screening while Katie was asked to elaborate on the Circle of Sisterhood Foundation, and why it is important to her. She also shared the mission of the Foundation and how to give and get involved. You can listen to the interview here. Thank you Grand Valley State, for your support! Go Lakers!